I'm a longtime fan of newspaper comics. The ability to succinctly make a point or to set up and deliver a punchline in a few words is an admirable skill. In today's paper, Chip Sansom's The Born Loser riffed on this theme of converting complex data into simple analysis. It calls to mind a skill I've worked on honing for many years, that of distilling a large amount of information into the most relevant, and more bite-sized, pieces for consumption. This skill is useful whether one is a worker bee reporting to his manager, or a manager reporting to an executive, or an executive reporting to the board, and so on. With technology we now have access to more data than ever before which we can incorporate into our analysis and decision process, and yet so many of us often overlook the critical step of distillation. Some years ago my team devised and launched the first conference on the use of competitive intelligence (CI) for law firm planning efforts. In those days the predominant tools seemed to be publisher rankings with accompanying demographics, which serve as catalysts to drive strategy. For example, a law firm partner may observe that several peer firms have launched an office in London, or in Silicon Valley, and therefore the firm takes steps to follow. Such a process appeals to the risk-averse and precedent-driven mindset of many lawyers -- if others have done it, it must be a good idea. The anecdote is most likely apocryphal, but is it so hard to imagine the law firm leader who viewed the AmLaw 100 summaries in July of 2000 and immediately set about looking into launching a Y2K practice, which for some reason seemed to be enormously popular with his peer firms the prior year? 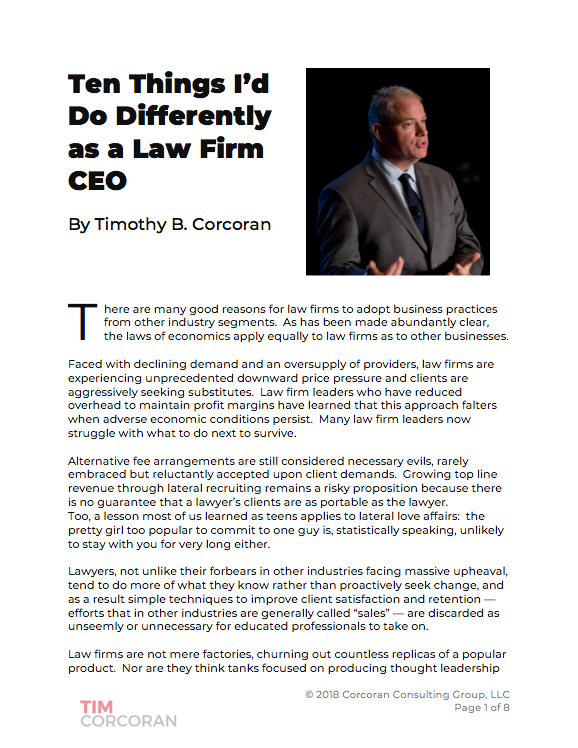 Today the situation is very different, with most large law firms using current competitive intelligence databases and techniques to assess their clients and competitors and understand market trends in order to incorporate this information into the strategic plan. The most common use of CI, it appears, is for routine pitches and lunch meetings. The usual process starts with a call from a partner, indicating that he needs to know all there is to know about a potential client in advance of a pitch meeting. Some combination of a reference librarian and a marketing analyst research the various databases, capture all the relevant information, de-dupe it (remove repetitive information), clean it, add a summary, and deliver a beautifully bound dossier to the partner. Trouble is, many times the information presented is too voluminous to be useful. I recall a project where a partner asked for my help preparing for two pitches -- one to a major US automotive manufacturer; the other to a major pharma manufacturer. We commissioned reports from the CI team and a few days later when we met to review the material, the conference room had two foot-high stacks of binders, one stack for each target. The binders were useless, as they consisted of lengthy printouts of financial statements, annual reports, analyst commentary and news articles. The summary was merely an index to the tabs separating the content. Needless to say, neither the partner nor I had the several hours it would take to read the material, so we prepared without it. I later sat down with the reference librarian and the marketing analyst to discuss a better approach. Both felt their respective efforts represent best practices. The reference librarian felt his role is to access as many of the right databases as possible and present the content essentially unfiltered, except for de-duping. His credibility depends on him delivering everything, because the worst case scenario is to omit an important fact. The analyst felt her role in cleaning up the data means organizing it and creating an index. She can't eliminate much because she can't possibly know what the partner might find relevant. Each was surprisingly dogmatic and inflexible. One law firm marketer I know well has a very different approach. She wields a red pen and uses it liberally, sending CI reports back to the researcher or analyst time and again until the output is concise and impactful. For example, she allows financial reports only in an optional appendix, and instead demands a trend summary in a line or two. "Revenues and earnings increased 7% and 11%, as a result of the recent acquisition of X Corp and the resulting post-merger pruning. These results compare with a 5-year CAGR of 4.5% and 9% respectively." Rather than merely listing all filings found through docket searches, she includes a pie chart showing major categories of litigation. This may also be accompanied with commentary culled from the data: "IP protection in emerging markets has been the greatest challenge in the past, but the trend has recently shifted toward products liability defense. As its products gain wider global distribution, the company faces increased scrutiny from regulators and safety advocates." She may also provide insights into areas of opportunity: "There are regular employment-related lawsuits, suggesting an opportunity to present our compliance training which reduces employer exposure" or "The recent JV in Brazil and other IP protection efforts in the area may suggest this is an important growing market. Perhaps our South American office can help their executives by making introductions to the various commerce officials with whom we have solid relationship." You get the picture. In these examples, the CI reports rarely reach a full two pages; they reference the source material if the lawyer wants more background (they rarely do); and the distillation provides the marketing team an in-depth understanding of the potential opportunities so they can begin working on pitch materials that will help highlight the firm's capabilities in these areas. Competitive Intelligence is the forum for today's example, but the same fundamentals apply to so many other situations. It's obviously much harder to distill complex information into succinct portions, but doing so flexes analytical muscles and positions the analyst as a value-added resource rather than a paper-shuffling clerk. You may wonder yourself if I could have delivered these points more succinctly. Probably. But then again, I am not a professional cartoonist.